Find artworks, auction results, sale prices and pictures of Bernardo Daddi at auctions worldwide. Mrs. Bredin, Bath, Somerset, England, until 1969. Acquired from the above by the present owner. S. Chiodo in M. Boskovits, ed., A Critical and Historical Corpus of Florentine Painting, Sect. IV, Vol. IX, Painters in Florence after the \“Black Death\”. The Master of the Misericordia and Matteo di Pacino, Milan, 2011, pp. 82 note 240, 83, 312-316, pl. LIII. C. Sciacca, ed., Florence at the Dawn of the Renaissance: Painting and Illumination, 1300-1350, exhibition catalogue, Los Angeles, 2012, p. 113, under no. 23, fig. 2.17 (entry by A. Tartuferi). On occasion, Christie\’\’\’\’s has a direct financial interest in lots consigned for sale, which may include guaranteeing a minimum price or making an advance to the consignor that is secured solely by consigned property. Christie\’\’\’\’s may choose to assume this financial risk on its own or may contract with a third party for such third party to assume all or part of this financial risk. When a third party agrees to finance all or part of Christie\’\’\’\’s interest in a lot, it takes on all or part of the risk of the lot not being sold, and will be remunerated in exchange for accepting this risk. The third party may also bid for the lot. Where it does so, and is the successful bidder, the remuneration may be netted against the final purchase price. If the lot is not sold, the third party may incur a loss. Christie\’\’\’\’s guarantee of a minimum price for this lot has been fully financed through third parties. Church of S. Giorgio a Ruballa, Bagno a Ripoli, near Florence, from which apparently removed before 1821. with Ugo Jandolo, Rome, from whom acquired by Michel van Gelder, Château Zeeerabbe, Uccle, Belgium, where recorded in the Salle Itallienne II by Dumont-Wilden (infra); and by descent. L. Dumont-Wilden, La Collection Michel Van Gelder, n.d., p. 16, no. 105, as 'Daddi'. A. Morassi, 'La mostra della pittura italiana ad Amsterdam' in Le vie d'Italia e del mondo, II, November 1934, p. 1316, as 'a la maniera di' Daddi'. R. van Marle, 'La pittura italiana alla Esposizione d'arte antica italiana a Amsterdam', Bollettino d'Arte, XXVIII, 1935, p. 302, as Daddi or 'un pittore molto affine a lui'. R. Offner, A Corpus of Florentine Painting, III, VIII, The Works of Bernardo Daddi, Florence, 1958, pp. 49-50 and 56, pl. XX1-2, as 'Workshop of Daddi'. F. Zeri, Quaderni di Emblema 1. Diari di Lavoro, Bergamo, 1971, pp. 15-16, as 'Daddi and workshop'. G. Damiani, 'Bernardo Daddi', in Dizionario Biografico degli Italiani, XXXI, Rome, 1985, p. 625, as 'Daddi and workshop'. M. Boskovits in collaboration with E. Neri Lusanna, ed., R. Offner, A Corpus of Florentine Painting, III, III, The Works of Bernardo Daddi, Florence, 1989, pp. 340, 342-343, 348 and 376, pl. XX1-3, where marked with an asterix to indicate the editors' attribution to 'Daddi himself'. E. Moench-Scherer, Les Primitifs Italiens du Musée des Beaux-Arts de Strasbourg, Strasbourg, 1993, p. 24, under no. 9, as 'Bernardo Daddi and workshop'. Amsterdam, Stedelijk Museum, Italiaansche Kunst in Nederlandsch Bezit, 1 July-1 October 1934, no. 103, as 'a master very near to Daddi'. These panels originally constituted two of the five sections of the predella of Bernardo Daddi's S. Giorgio a Ruballa polyptych of 1348, now in the Courtauld Institute of Art, Gambier Parry Collection, London (fig. 1). Daddi was the most lyrical and refined of the early followers of Giotto, memorable as a colourist and for the consistent delicacy of his forms. 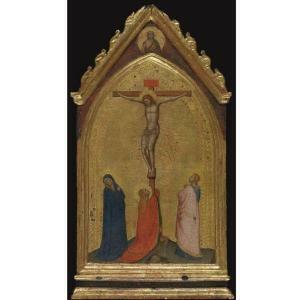 He was arguably the dominant artistic personality in Florence in the last two decades of his life, dying on or about 18 August 1348, soon after the altarpiece, which is his last signed and dated work, was completed. That the altarpiece was by Daddi himself was accepted unanimously by early scholars, including Fry, Suida, Sireén, Venturi, Schubring, van Marle and Berenson. Offner in 1947 gave it to his 'Assistant of Daddi', but subsequently regarded it as from Daddi's studio, but others, including Antal, Steinweg, Degenhart and Schmitt, Bellosi, Fremantle and Zeri have regarded it as substantially autograph, a view championed most recently by Miklós Boskovits. In 1935, van Marle correctly associated these panels of saints with one of Saints Margaret and Agnes at Strasbourg. Offner in 1958 identified a panel of the Madonna and Child with four Angels, then in the possession of Miss R. Lawrence Jones as the central element of the predella, and recognized that all four panels were components of the S. Giorgio a Ruballa polytych: the missing panel, with Saints Gregory and an Evangelist, then in the Stanley Simon collection, New York, was identified by Zeri in 1971. The Saint Lucy and Saint Catherine of Alexandria was the left-hand element of the predella, while the Saint John the Evangelist and the Saint Nicholas of Bari (? ), which, as the borders indicate were originally parts of a single panel, was, taken from the left, the fourth of the five sections of this. Offner persuasively points to the way in which the paired saints of the four lateral sections of the predella echo those of the four panels of pairs of full-length saints flanking the central compartment of the altarpiece, the Crucifixion. In the main tier Daddi uses profiles and near profiles to almost architectural effect, linking the various elements of the design and bridging the obvious differences in scale between the main panel and those at either side. The intelligence that lay behind the overall design is demonstrated by the way the heads in these panels and their companions from the predella are seen at angles echoing those of the lateral saints of the main tier. 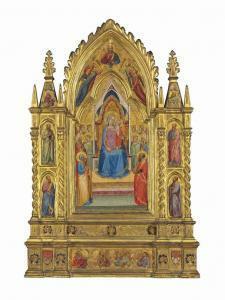 But above all it is in his use of colour that Daddi united the components of the altarpiece. Blue, the most expensive pigment of the time, has a dominant role: six of the eight full-length saints are dressed at least in part in blue, sometimes of course for proper iconographic reasons; and the colour is also used for some of the soldiers in the Crucifixion. Saint Catherine's position as a princess is emphasized by the elegant brocade of her dress. This echoes the brocaded mantles of Saints Bartholomew and Stephen in the upper tier and, as the artist and his patrons would have been well aware, was of a type manufactured in and imported from the Near East. After the Stoclet collection, the one formed by Michel van Gelder was among the most ambitious assemblage of early pictures and works of art formed in Belgium in the early twentieth century. In the Château Zeeerabbe, the Dining Room contained Dutch and Flemish seventeenth-century pictures, but two rooms were dedicated to early Italian pictures, a third, the 'salle gothique' to early Netherlandish pictures, and a fourth to the seventeenth-century Dutch masters. overall: 40.5 by 22.8 cm. ; 16 by 9 in. Hamburg, Kunsthalle, by whom sold, circa 1960. V. Dirksen, 'Die Sammlung Wedells in Hamburg', Kunstchronik und Kunstmarkt, XXXIII, 1922, p. 757, as Circle of Bernardo Daddi. A. Rohde, 'Die Galerie Wedells in Hamburg', Der Cicerone, XIV, no. 12, 1922, p. 506. B. Berenson, Italian Pictures of the Renaissance, Oxford, 1932, p. 166, as Daddi. R. Van Marle, 'La Collezione del Haus Wedells di Amburgo', Dedalo, XIII, 1933, p. 244, illustrated pp. 245 and 246 (detail of donor), as Daddi. R. Offner, A Critical and Historical Corpus of Florentine Painting, III, IV, Bernardo Daddi, His Shop and Following, New York, 1934, pp. 121-2, 133, pls. XLVIII, XLVIII1 (detail of Madonna and Child), XLVIII2 (detail of Mary Magdalen), XLVIII3 (detail of donor), as close following of Daddi. B. Berenson, Pitture italiane del rinascimento, Milan, 1936, p. 142, as Daddi. D.C. Shorr, The Christ Child in devotional images in Italy during the XIV century, New York, 1954, pp. 183-4, illustrated, as follower of Daddi. B. Berenson, Italian pictures of the Renaissance: Florentine School, London and New York, 1963, I, p. 54, as Daddi. B. Klesse, Seidenstoffe in der italienischen Malerei des 14. Jahrhunderts, Bern, 1967, p. 192, no. 51d, as follower of Daddi. M. Boskovits, in R. Offner, A critical and historical corpus of Florentine painting, III, IX, The painters of the miniaturist tendency, Florence, 1984, p. 32, note 98, as Daddi. R. Offner, A critical and historical corpus of Florentine painting, III, III, The works of Bernardo Daddi (revised ed. by M. Boskovits), Florence, 1989, pp. 46 and 85, note 56, as close following of Daddi. 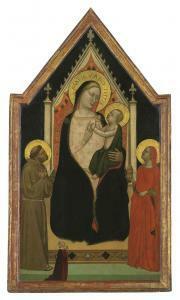 M. Boskovits, The Thyssen-Bornemisza Collection: Early Italian Painting, 1290-1470, London, 1990, p. 64, note 1. R. Offner, A Critical and Historical Corpus of Florentine Painting, III, IV, Bernardo Daddi, His Shop and Following (revised ed. by M. Boskovits), Florence, 1991, pp. 23, 363-4, pls. XLVIII (prior to cleaning), XLVIII (detail of donors) (recording Klara Steinweg's manuscript opinion that painting, following its cleaning, is by Daddi himself), p. 389 (with Offner's attribution to the close following of Daddi), pp. 508, 511 (attributed by Boskovits to Daddi himself). Hamburg, Kunsthalle, exhibition of Wedells collection, 1935. Bernardo Daddi was with Taddeo Gaddi one of the two outstanding Florentine painters of the generation that succeeded Giotto's. Giotto himself was the formative influence of his early style, but Daddi reacted to other artists, including the Saint Cecilia Master, and had a distinct personality of his own, a sense of rhythm, beautifully expressed in this panel by the upturned faces of the two saints, and a languorous, indeed poetic, taste, exemplified here by the type of the Madonna herself. 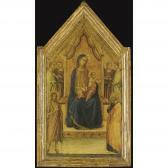 Daddi is particularly associated with the production of small portable triptychs, but was also responsible for a number of major commissions for prominent churches, including Santa Croce and the Cathedral. This panel was probably the central element of a tabernacle, very probably in a Franciscan church. Offner, who was very restrictive in attribution of pictures to Daddi, considered this to be from the artist's close following. But Berenson consistently recognized that it is by Daddi himself, and this view was accepted by van Marle, by Roberto Longhi (in a letter of 11 April 1961 referred to by Boskovits in the 1991 edition of Offner), by Klara Steinweg (referred to in the same), and most recently by Miklos Boskovits in his publications of 1984, 1990 and 1991. Offner proposed a date of about 1340, and Boskovits observes that the upward looking pose of Saint Francis is similar to that of the saint on the lateral panel of the Prato pentatych, which he dates to the mid-1330s and in the small portable triptych at Pittsburgh (Offner, 1991, pls. XV and XXIX): in the former it might be argued that the saint's gaze is directed above the Madonna and Child, whereas in this panel it is clearly directed at the Child. Daddi's types were consistent, but are subtly varied between related compositions, as is indeed the case with this panel, in which the heads of both the Madonna and the Child are very close in detail to those of the beautiful small Madonna and Child in the Berenson collection at I Tatti (Offner, 1989, pl. XIII, in which the Madonna's hands are also similar but differently disposed) and in the main panel of the San Pancrazio altarpiece (Florence, Uffizi, op. cit., pl. XIV). 23 3/4 by 13 in. (including frame); 60.3 by 33 cm. Anonymous sale, London, Christie's, January 29, 1954, lot133;Anonymous sale, London, Sotheby's, February 22, 1956, lot 81 (as'Daddi'), for £440 to Buttery;With Horace Buttery, from whom purchased by a private collector andhis wife;By whom offered anonymously ('The Property of a Lady and aGentleman'), London, Christie's, April 15, 1992, lot 42. R. Offner, A Critical and Historical Corpus of FlorentinePainting. The Fourteenth Century, Section II, Vol. VIII, New York1958, pp. 148-49, reproduced plate XXXIX. The overall composition repeats that of a larger panel, dated1343, formerly from the Convent of Santa Maria del Carmine and nowin the Galleria dell'Accademia, Florence.1 Thepositioning of the principal figures is exactly the same in eachpanel, though here the artist has omitted the angels collectingChrist's blood from His wounds. The painting in the Accademia wasprobably the central panel of a polyptych of tabernacle and thesame is likely for this panel which, being on a smaller scale,might have been the central panel of a portable tabernacle. Both Offner and Dr. Klara Steinweg (whose opinion is quoted byOffner) regarded this panel as the work of the "Assistant ofDaddi." The paintings grouped under this name have since beenrecognised by Prof. Miklòs Boskovits as late productions by Daddihimself. On the basis of photographs Prof. Boskovits endorsed theattribution to Daddi at the time of the painting's last appearanceon the market in 1992 and he proposed a date of execution of circa1345-48. 1. Inv. 8570; 125 by 58 cm. ; see R. Offner, The FourteenthCentury. Bernardo Daddi and his Circle, Section III, vol. V, ed. M.Boskovits, Florence 2001, pp. 193-98, reproduced plate XV.